A stick bag that stands! The versatile SABIAN Stick Flip starts out as a drumstick bag, then unzips, flips, and morphs into a drumstick holder - making transport a breeze! 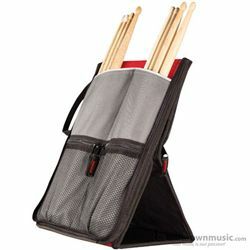 The Stick Flip morphs from drumstick bag to drumstick holder with our proprietary Flip design. The transformation is quick and smooth - no snaps or special connections required. During the gig, it sits right next to you, putting spare sticks within arm's reach. When the gig is over, it quickly folds back into a stick bag and you're ready for the next show.